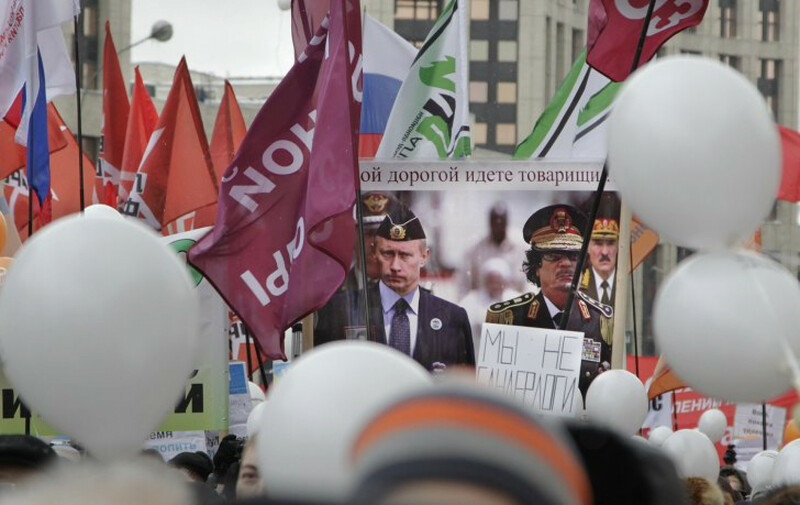 Organizers of last weekend's anti-Kremlin rally in Moscow, allegedly the biggest street protest since 1993, were divided on whether they could press authorities into cooperating. 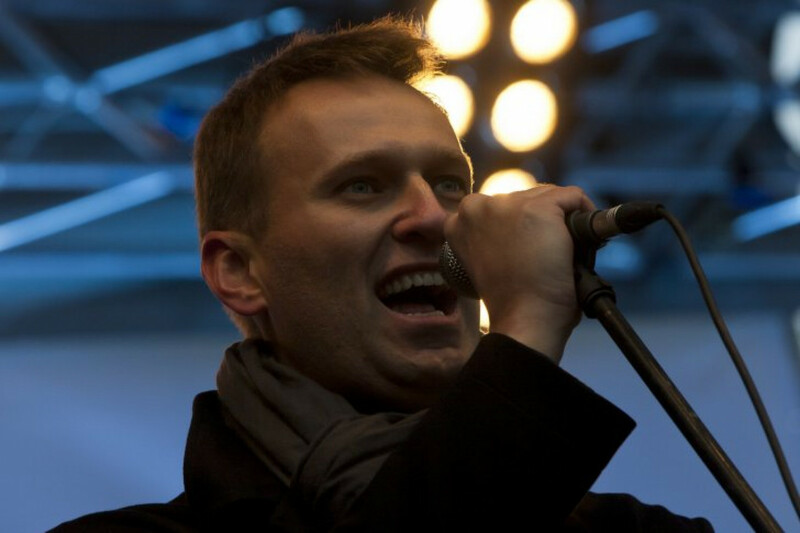 Anti-corruption activist Alexei Navalny wrote on his LiveJournal blog that "inhabitants of the Kremlin declared readiness to evolve for the sake of survival." "For now, this readiness appears to be a ruse and a con game, but that's normal. 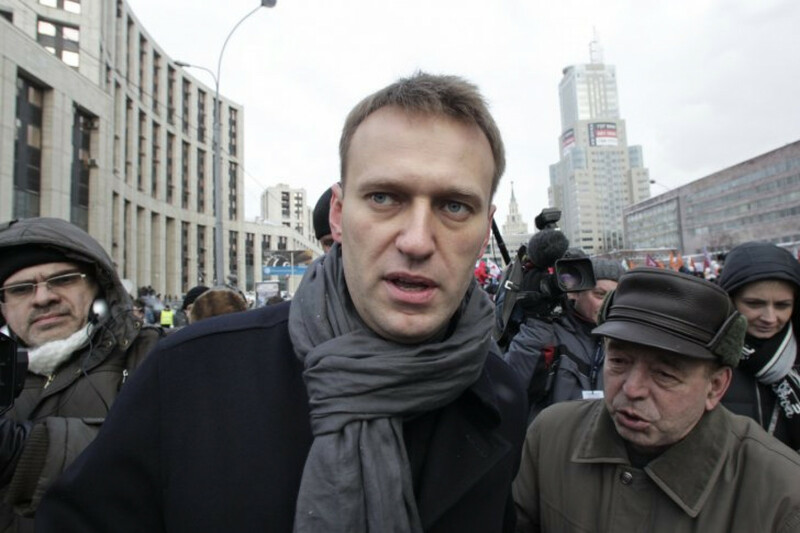 Everyone wants to save face," Navalny wrote Sunday. 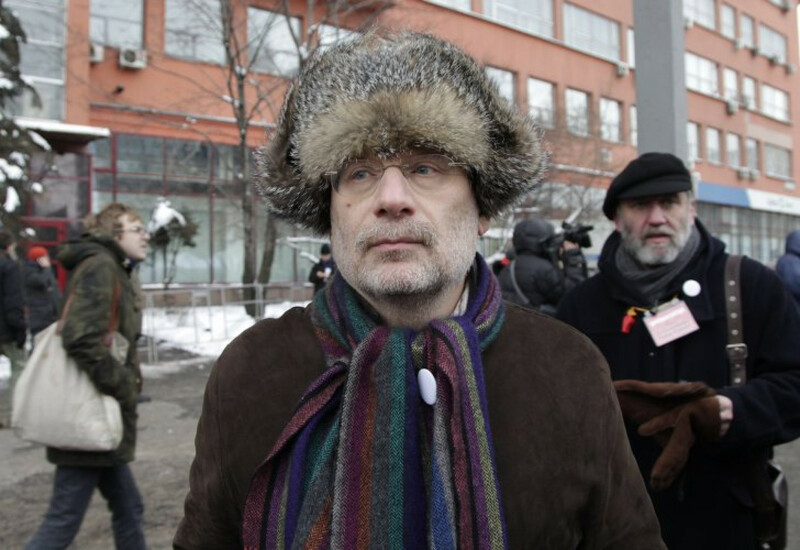 But liberal opposition leader Garry Kasparov said a new prison sentence for radical protester Sergei Udaltsov, passed Monday, indicated that the Kremlin plans no compromise. 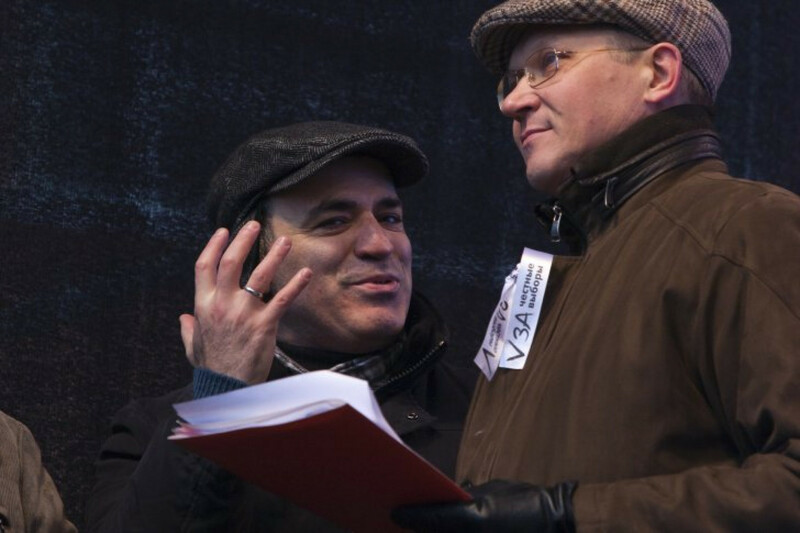 A new 10-day incarceration for Udaltsov over his past protest activity "shows that authorities are not going to fulfill a main demand of both rallies — to free political prisoners," Kasparov wrote on his own LiveJournal. 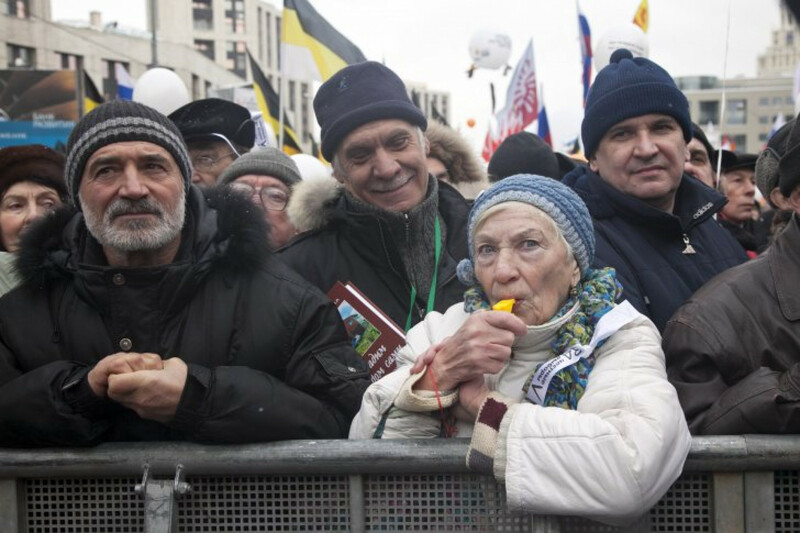 Between 29,000 and 120,000, by various estimates, rallied on Prospekt Akademika Sakharova on Saturday to protest alleged violations at the Dec. 4 parliamentary elections, won by the ruling United Russia party, as well as the Kremlin's overall tight control of the country's political life. The grassroots protest, the second of its kind and size in as many weeks, came after a near-decade of public apathy and apparently left the authorities confused. 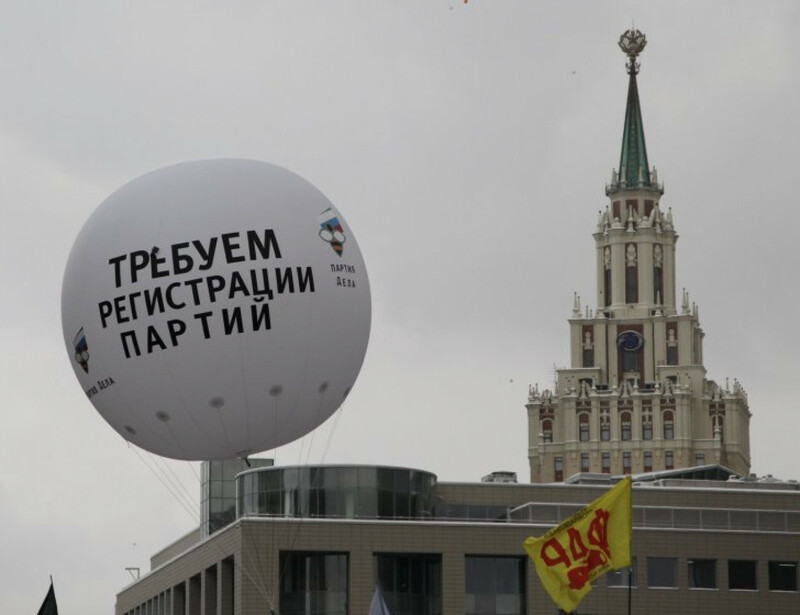 The Kremlin earlier this month proposed to liberalize political legislation and restore direct gubernatorial elections, but only after the presidential election, which Prime Minister Vladimir Putin is poised to win. 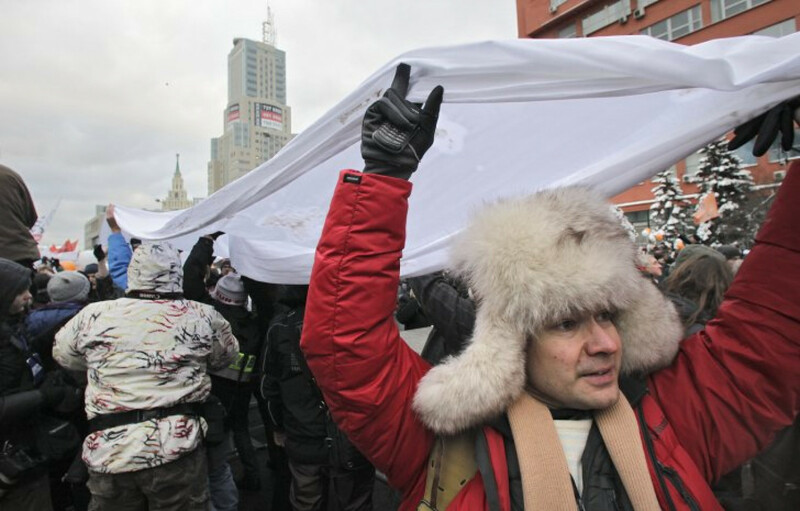 It also showed no indication of accepting the protesters' demands for a repeat State Duma vote and firing of Vladimir Churov, head of the Central Elections Commission, as well as the release of Udaltsov. 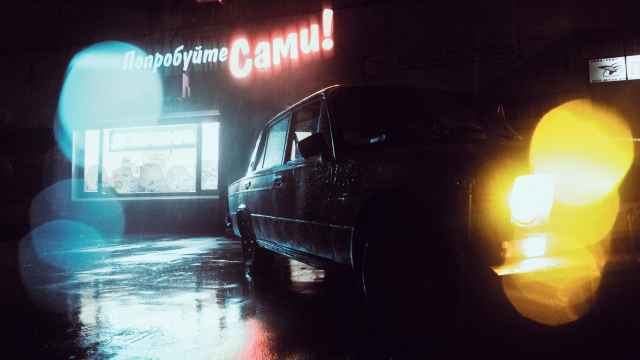 Medvedev did not comment on the Saturday rally, while Putin's spokesman Dmitry Peskov insisted on Ekho Moskvy on Sunday that opposition to his patron is still in the minority. 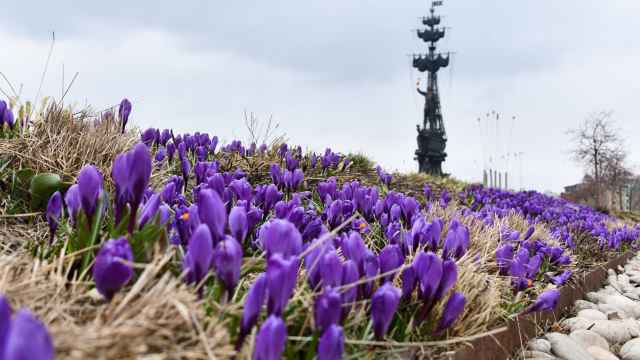 Putin's approval rating stood at 51 percent this month, down 10 percent from the previous poll in November, Levada Center reported. 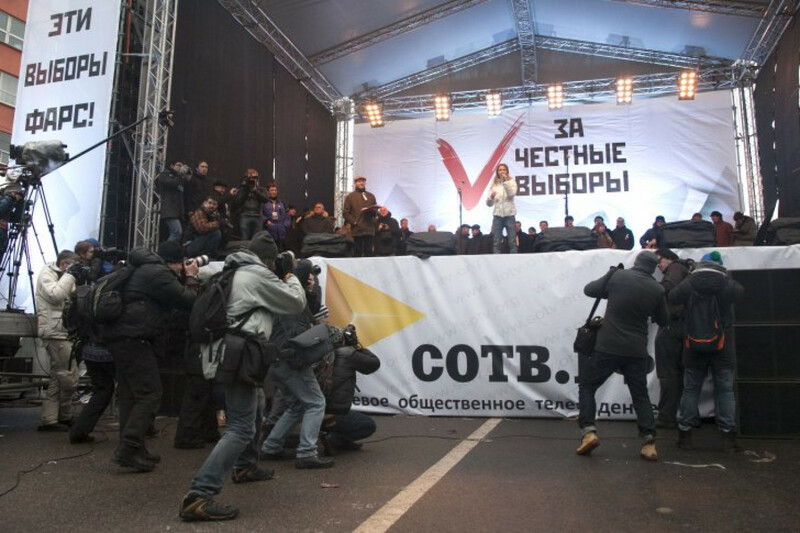 In a sign that authorities may be ready to slacken the reins a bit, the firmly pro-Kremlin television channels NTV and Channel One lifted their tacit ban on covering opposition activities, reporting Saturday's rally in their news. 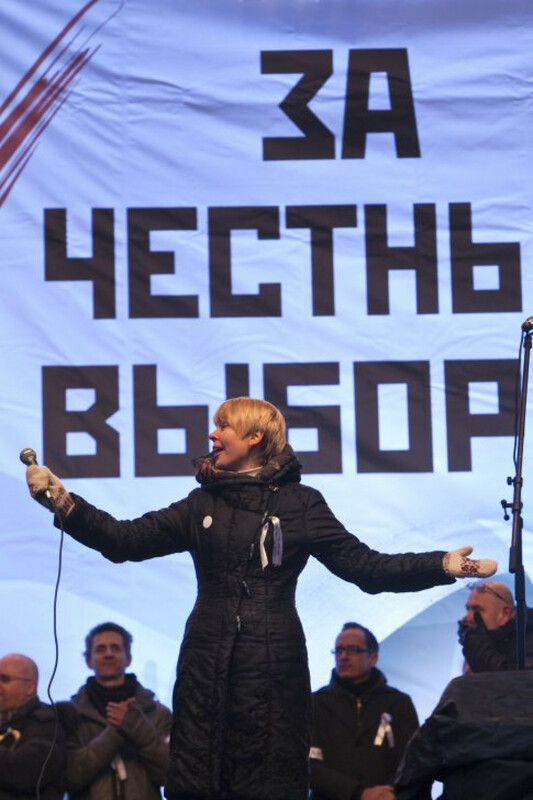 At the same time, state news agency RIA-Novosti covered the protests under a headline that read: "The rally on Sakharova failed to transform the quantity of people into the quality of ideas," which sparked allegations of bias in the blogosphere. 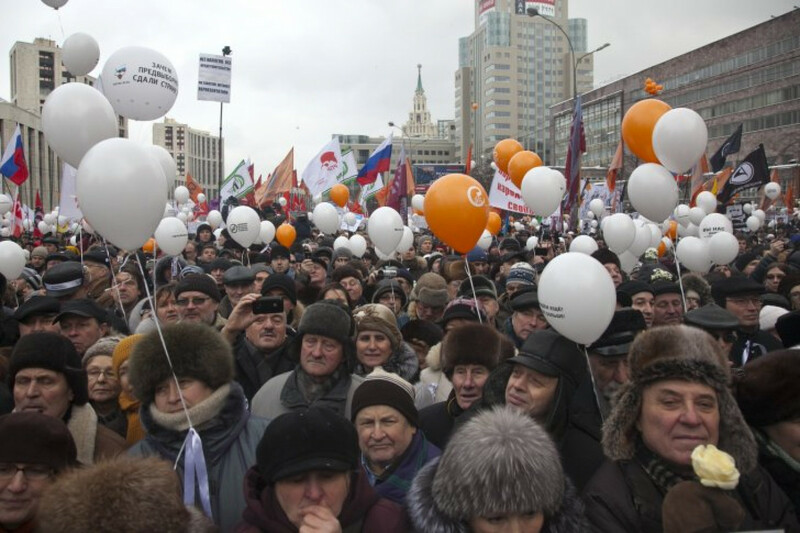 Admittedly, domestic coverage was more accurate than reports aired in neighboring authoritarian Belarus, where local television put attendance at the Saturday's rally in Moscow at several hundred people. No consensus was to be had about the real attendance, but even the most conservative estimate, provided by the city police, put the number of participants at 29,000. That number needs to be taken with a grain of salt, given that police said back in April that a pro-Kremlin rally on Prospekt Akademika Sakharova attracted 50,000 activists — even though photos comparing both events that circulated in the blogosphere showed the Saturday rally being packed far more tightly than the pro-Kremlin one. 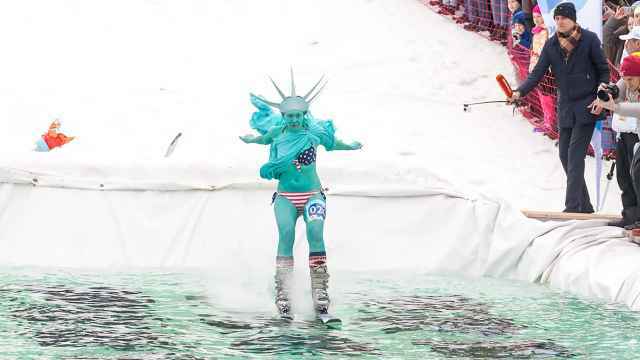 Organizers said that up to 120,000 attended Saturday. Novaya Gazeta's volunteers who counted the people at the entrance spoke about 102,000, while RIA-Novosti estimated their numbers at about 45,000. 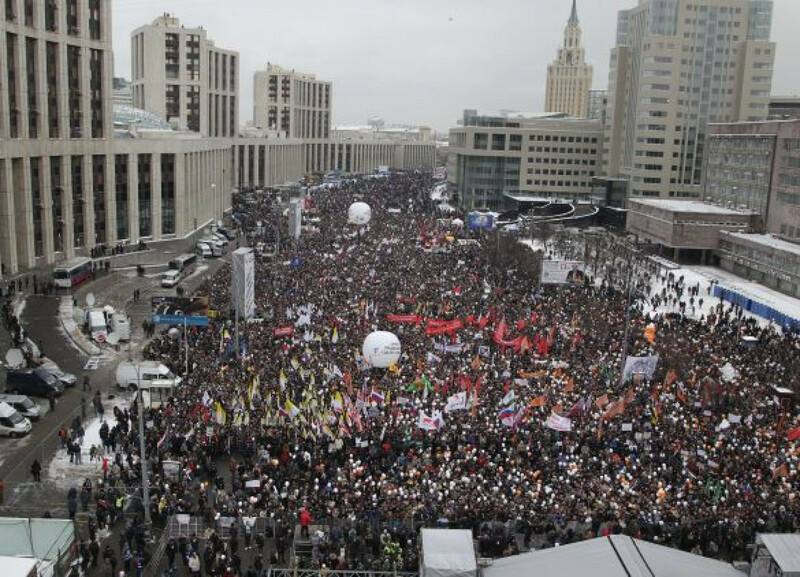 The Moscow Times reporters at the event put the figure at between 60,000 and 80,000. 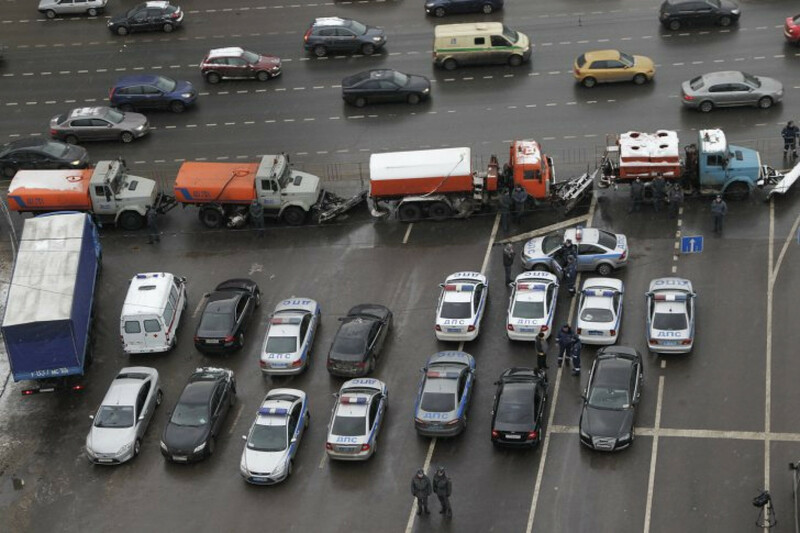 "It's not about the numbers, but about the fact that the participants who have voiced their simple and legal demands will not back down, will not grow bored and will not be stopped by the weather," Navalny said on his blog. 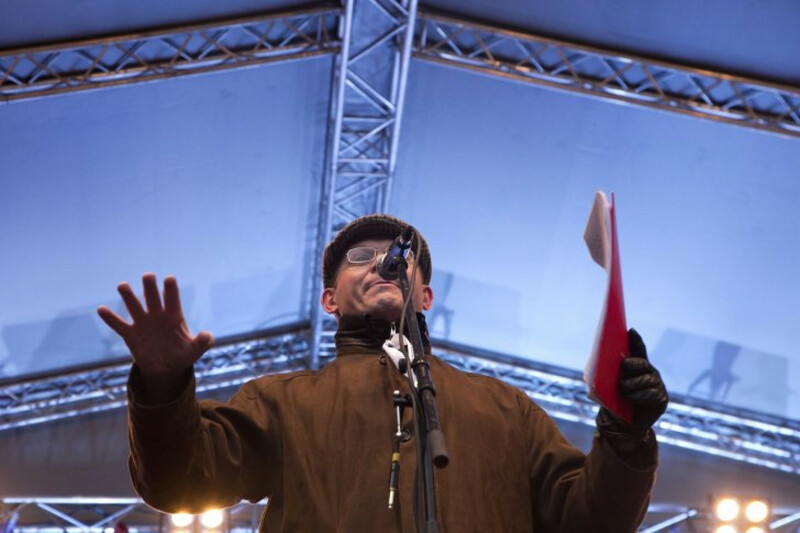 The Saturday rally had a prequel on Dec. 10, when between 30,000 and 60,000 gathered on Moscow's Bolotnaya Ploshchad to protest the Duma vote and demand a repeat election. Speakers at Prospekt Akademika Sakharova said a new event would take place in January or February, when the presidential race will be picking up steam. Prime Minister Putin is still expected to win the vote on March 4, though the opposition says this is because no independent candidates will be allowed to compete against him. 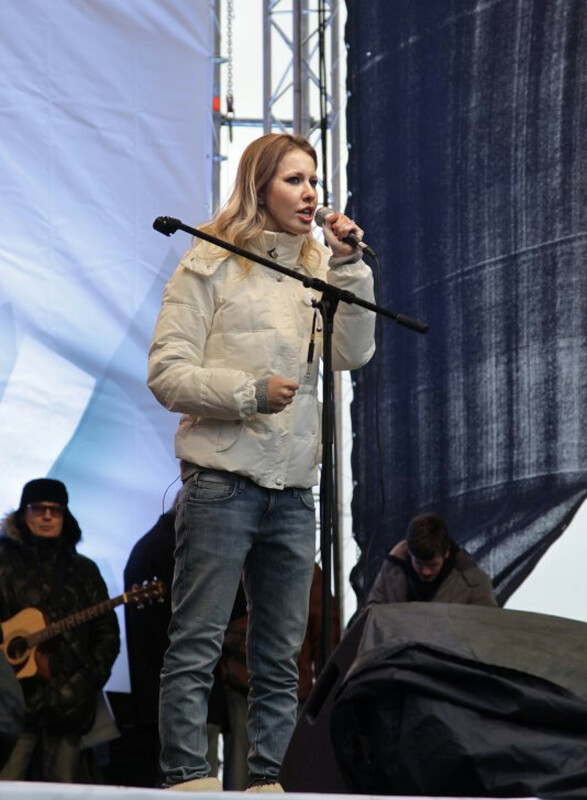 The event attracted a wide array of speakers, ranging from Navalny and liberal politician Boris Nemtsov to writer Boris Akunin, ultranationalist leader Vladimir Tor, Kremlin-connected socialite Ksenia Sobchak and even former Finance Minister Alexei Kudrin. 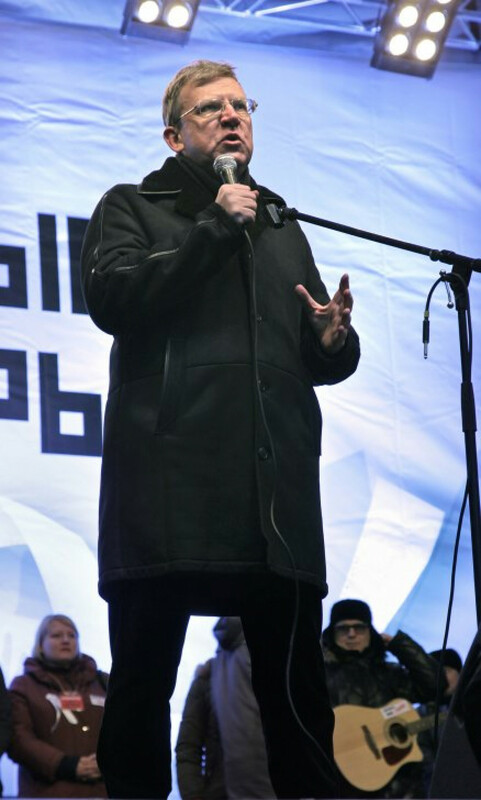 "The slyest rats are deserting the sinking ship," Tor said of Kudrin and Sobchak, both of whom voiced solidarity with the protesters but also urged for caution and promoted dialogue with authorities. 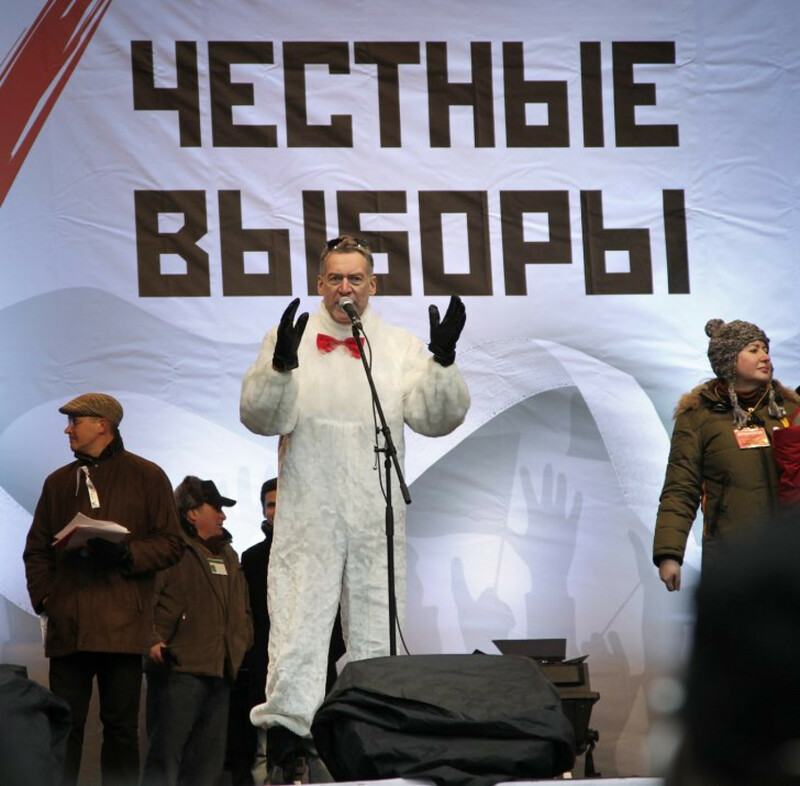 On the rally's eve, Kudrin also said he is willing to lend a hand in creating a new political party to represent the middle class, which forms the backbone of the protests. 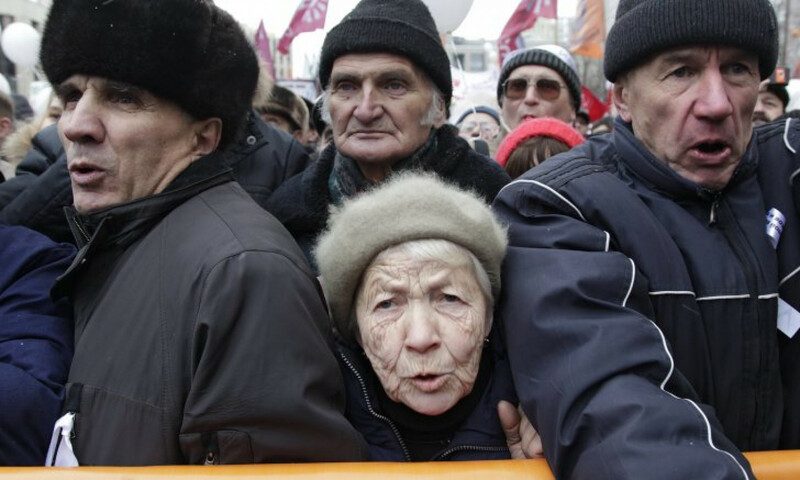 Judging by the Saturday rally, discontent with Putin, who has been seen as a de-facto leader of the country since 2000, has spread to people of all ages, from high school students to pensioners. 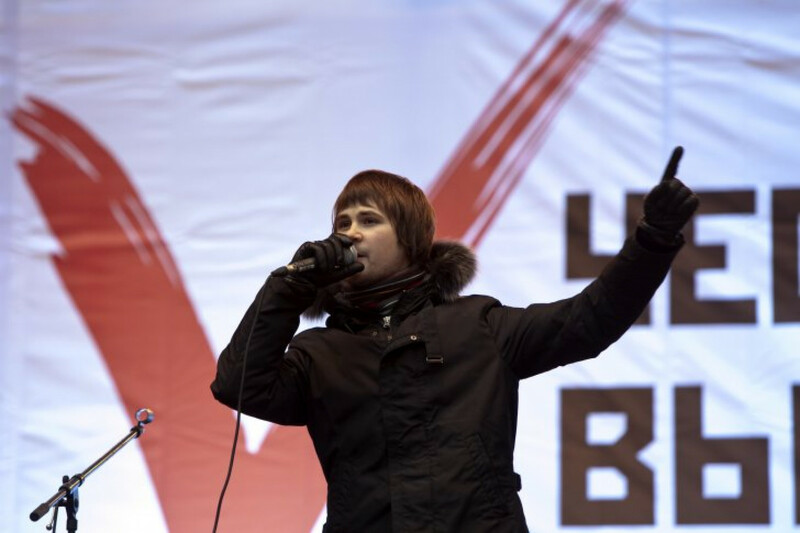 Liza, a 17-year-old schoolgirl who carried a life-size cutout of Soviet-era rights activist Andrei Sakharov, for whom the rally's venue is named, said she was "for clean elections." She declined to give her last name, possibly to avoid problems with teachers. 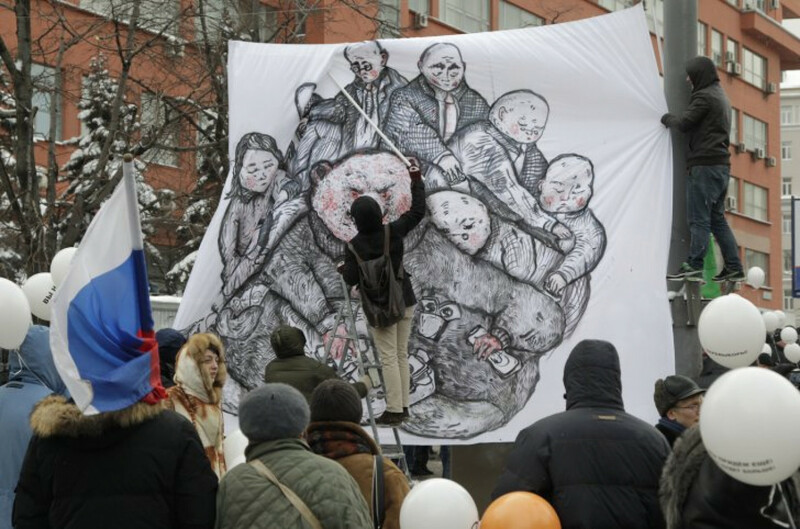 IT specialist Konstantin Ivanov — at 28, a representative of the rally's dominant age group — sported several badges reimagining Edward Munch's "The Scream," with the words "Putin. Again?" attributed to the screamer. Ivanov said he came to the rally because he "didn't like the hypocrisy of the authorities … and the future that they are preparing for me." 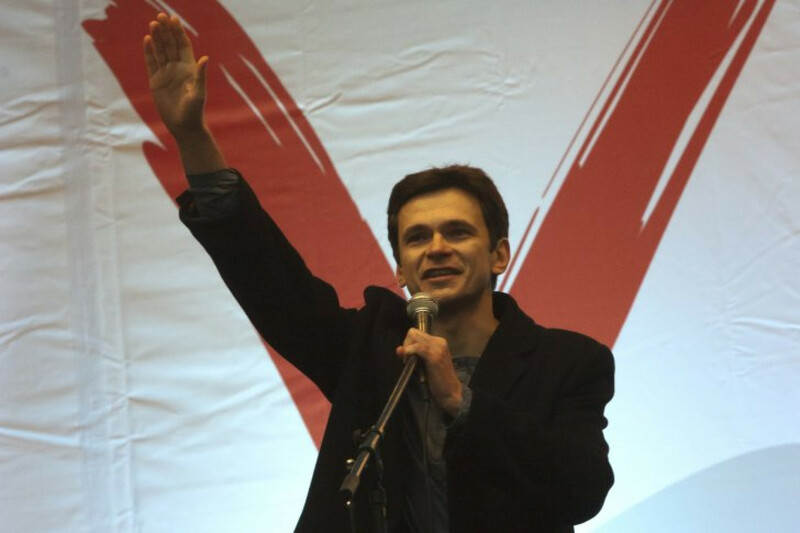 He added that he was at both protest rallies in December and posted stickers and participated in flashmobs around the city to promote the event on Prospekt Akademika Sakharova. 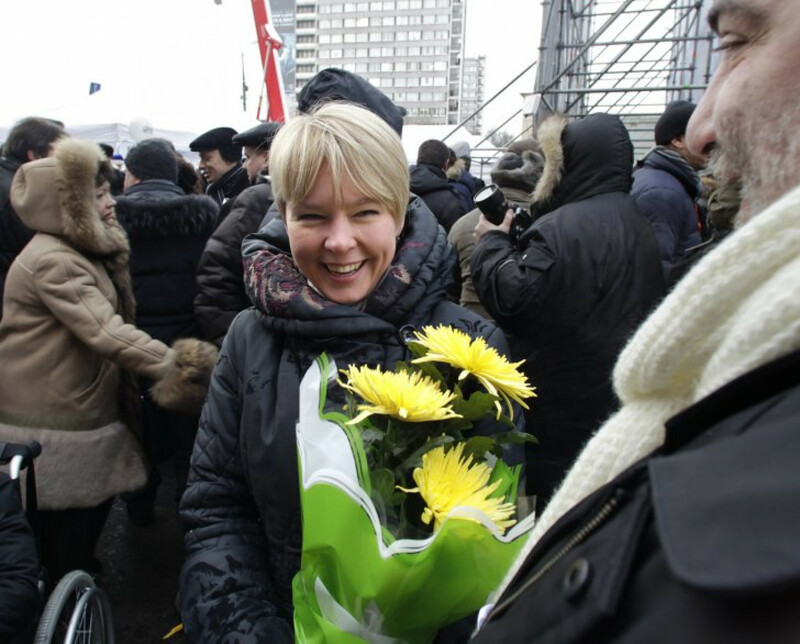 "We will keep going until our complaints are addressed," said Yulia, 35, a television worker, who declined to give her last name for fear of reprisal from her employer. Valentina Legonkova, 67, employed in the publishing business, said she was "glad that the people have bucked up." 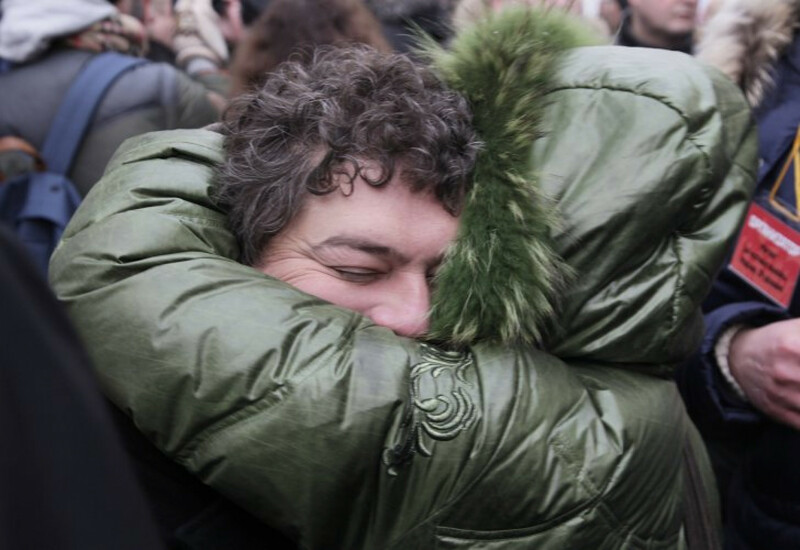 Some well-known figures were also spotted in the crowd but not on stage, among them billionaire and presidential candidate Mikhail Prokhorov; Marina Khodorkovskaya, mother of jailed oil tycoon Mikhail Khodorkovsky; Kommersant reporter Oleg Kashin; and Viktor Anpilov, a radical Communist leader from the 1990s. 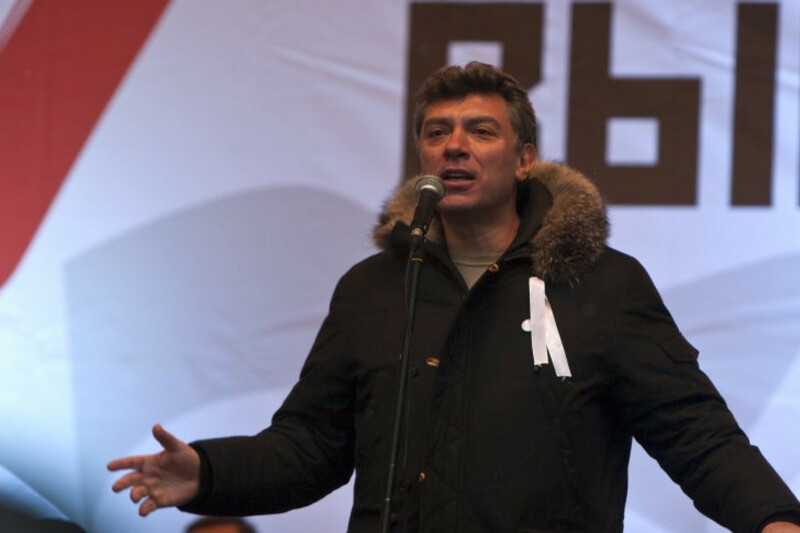 Liberal opposition leader Boris Nemtsov wrote on his LiveJournal blog Monday that thousands of ordinary people organized Saturday's rally and thanked some of them personally. 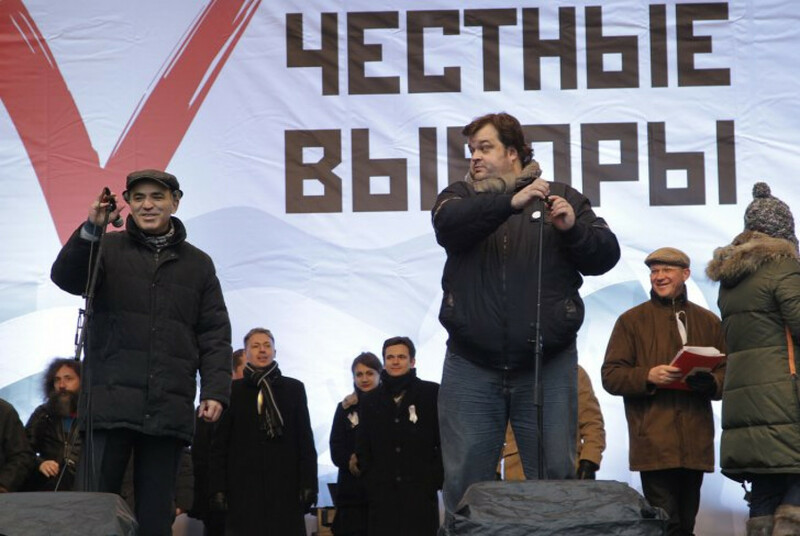 The 3 million ruble ($100,000) bill for the rally was footed through a donation drive in less than two weeks. Staff writers Alexander Bratersky, Rachel Nielsen, Kevin O'Flynn and Alexander Winning contributed to this report. 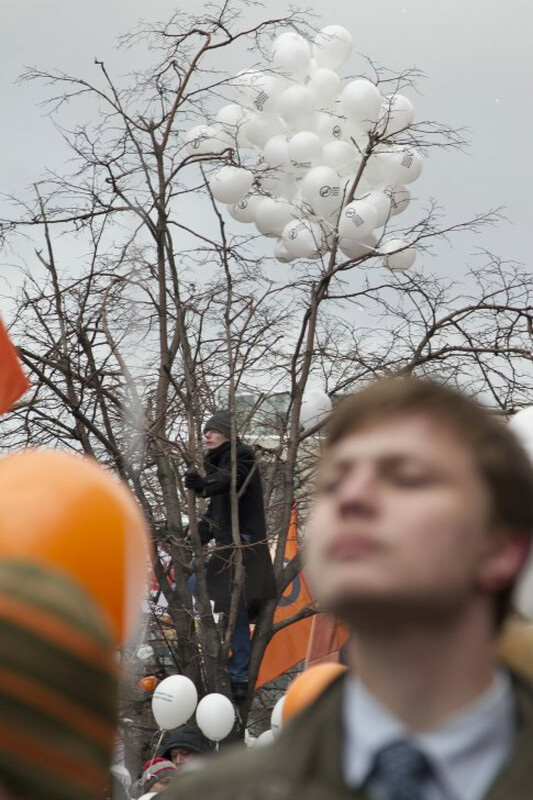 See more photographs from the Dec. 24 protest in Moscow in our photo gallery.